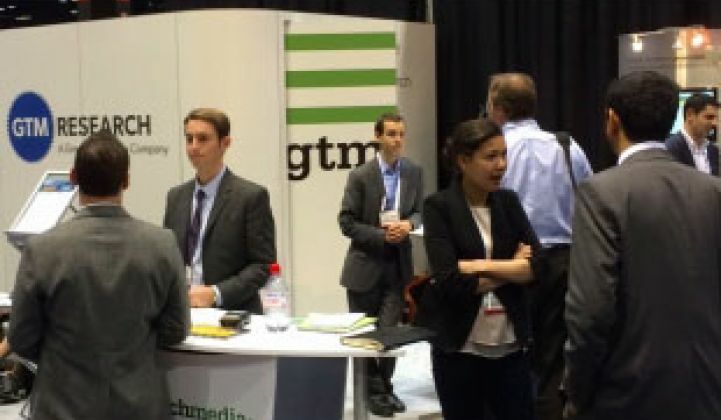 GTM Research Solar Analyst Cory Honeyman spoke this week at Solar Power International's Industry Trends booth, where he homed in on five U.S. states with big upside in solar growth. 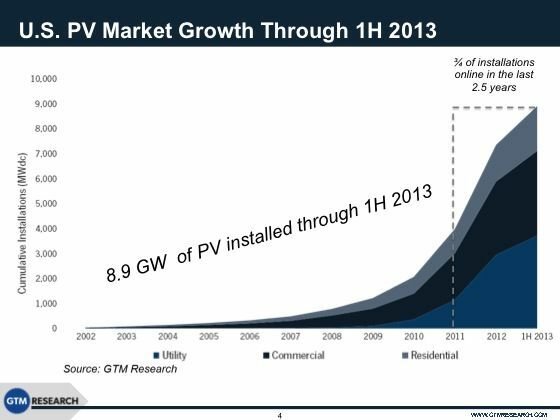 Growth in U.S. solar has been remarkable. As we've reported, 8.9 gigawatts of solar have been installed through the first half of 2013 and the 10-gigawatt threshold was crossed recently. What's more, three-quarters of U.S. solar installations have happened in the last 2.5 years. Up until now, this demand had been clustered in six established state markets (California, New Jersey, Arizona, North Carolina, Massachusetts, and Hawaii). California alone deployed 846 megawatts in the first half of 2013. But this clustered growth is subject to change. Here are five states staged for growth due to a combination of favorable market fundamentals, regulatory regimes and state incentives. Demand for solar in Georgia will be driven by an attractive feed-in tariff and utility-scale RFPs for twenty-year PPAs. The Georgia Advanced Solar Initiative offers 13 cents per kilowatt-hour for distributed generation and 12 cents per kilowatt-hour for utility-scale solar. 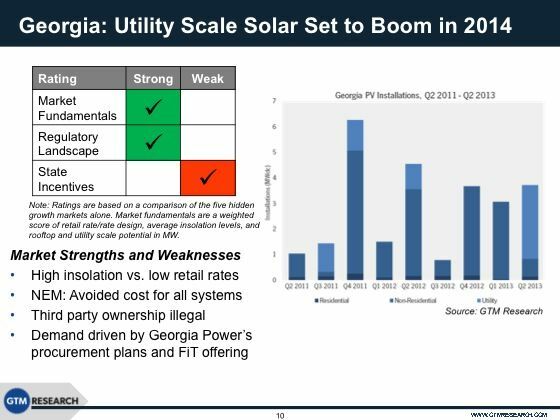 Items that cloud the solar value proposition in Georgia are uncertain rate cases and potential fixed charges. Note that third-party ownership is illegal in Georgia. 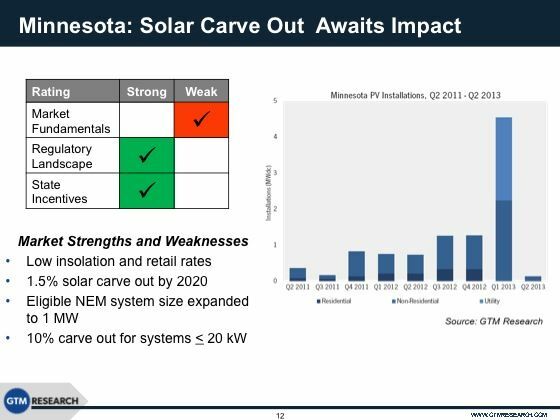 Minnesota currently has only 12 MW to 14 MW of solar installed -- but that could change in the coming years. Despite low solar insolation and low retail rates, the biggest driver will be the 1.5 percent solar carve-out. That should equate to 450 megawatts of demand, along with a 10 percent small-scale DG carve-out. 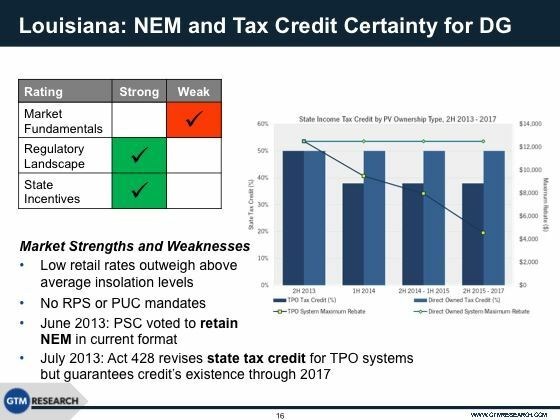 The state has NEM certainty through 2017 and a VOST methodology under review. Rate design will be finalized in early 2014. 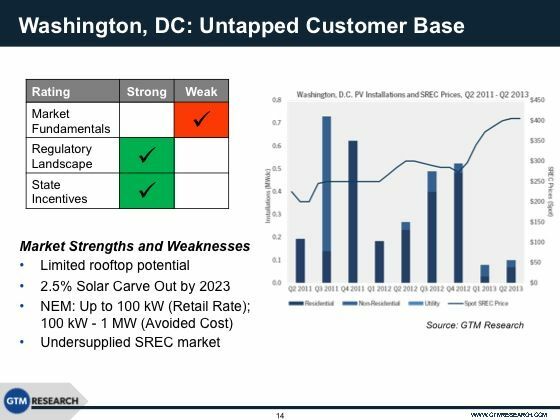 Although Washington, D.C. has limited rooftop potential, its 2.5 percent solar carve-out by 2023 and an undersupplied SREC market make for a strong regulatory landscape. One of the hidden growth opportunities in D.C. is the the community energy renewables law, which legalizes net metering for "solar gardens" of up to 5 megawatts. Owners of the shared solar installations retain the right to SRECs. The 2.5 percent solar carve-out equates to about 250 megawatts of demand through 2023. Honeyman called Louisiana "almost unexplored" with its current 10 megawatts. The state has above-average insolation but weak market fundamentals with no RPS or PUC mandates. The NEM is due to remain in its current format. Act 428 revises the state tax credit for TPO systems but guarantees the credit's existence through 2017. 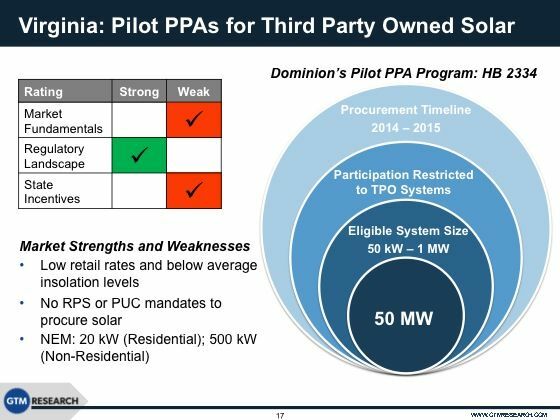 Virginia's Dominion Energy has a 50-megawatt pilot PPA program legislated by HB 2334, which trumps low retail rates, low insolation, and weak market fundamentals.The law and pilot focus on TPO for medium- and large-scale commercial installations. Honeyman concluded that Georgia might have the most potential demand; the most attractive market might be Washington, D.C. with its aggressive SREC prices; the "best value proposition" is the Minnesota small-scale DG market with its guaranteed demand and known PBI. Taken together, there could be more than 1 gigawatt of demand from these five states over the next five years. This is just a sip of the flood of data on U.S. solar markets provided by GTM Research and its U.S. 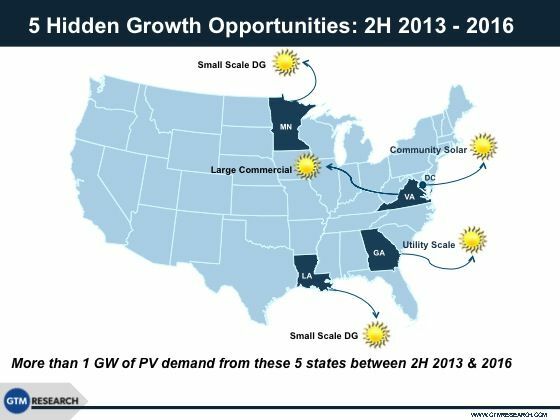 Solar Market Insight quarterly report, as well as the upcoming U.S. SMI Summit in December. Hope to see you there.